With a magnificent true blue dial, created at their own manufactory in Pforzheim the Glashütte Original Senator Chronometer Blue Dial edition offers up a new face plus German-Certified accuracy. White gold + a blue dial - it's a winning combination for any watch company's portfolio. Even so, this new Senator piece has an abundance of loupe-worthy subtleties to be enjoyed. Its blue dial has a delicate grainy finish and a closer inspection reveals that the day/night display below the 12, and the seconds subdial at the 6 o'clock location are marginally recessed while the panorama date window goes just a litttle deeper. 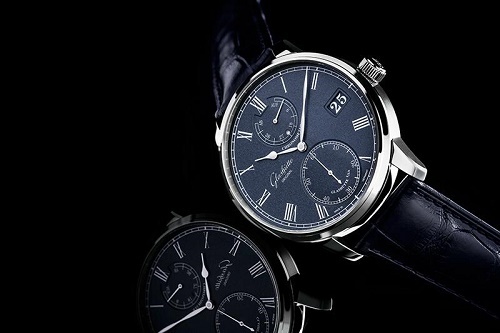 Pencil-slim hands, whisker-slim Roman numerals and an über- skinny chapter ring accentuate the elegant styling, and as with everything which Glashütte Original make, this piece does not scream quality, instead it whispers it in a hushed tone. Inside the 42mm 18ct white gold case, the Calibre 58-01 is meticulously finished, and has its accuracy verified by the German Calibration Service. A seconds-stop mechanism means that the seconds hand will reset to zero and wait respectfully while the minutes are adjusted thus precise time-setting is achieved.